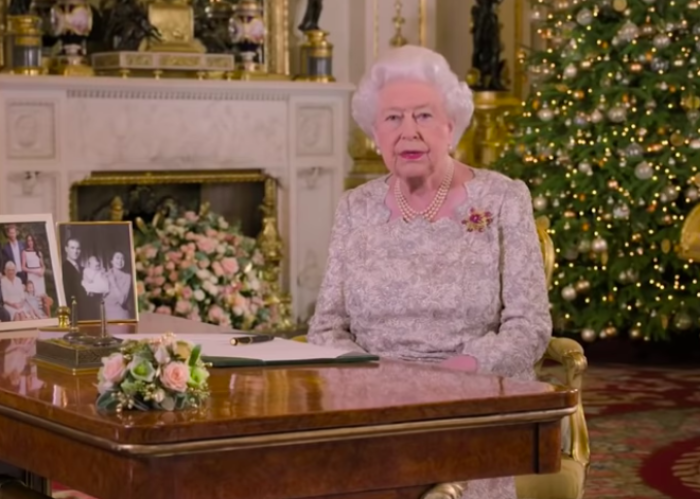 As part of her annual Christmas message, Queen Elizabeth II issued a call for unity and stressed that Jesus Christ’s message of "peace on Earth and good will toward all" is "never out of date" and is "needed as much as ever." "The Christmas story retains its appeal since it doesn't contain theoretical explanations for the puzzles of life," the 92-year-old monarch said. "Instead, it is about the birth of a child and the hope that birth 2,000 years ago brought to the world. Only a few acknowledged Jesus when he was born, now billions follow him." Speaking from the White Drawing Room at Buckingham Palace, the Queen also reflected on the importance of “faith, family and friendship.” This year, she said, has seen a number of joyful events, including two weddings — that of Prince Harry and Meghan Markle, Princess Eugenie and Jack Brooksbank — and the third royal baby of the expectant Prince William and Duchess of Cambridge Kate Middleton. "Two weddings and two babies and another child expecting soon. It helps to keep a grandmother well-occupied," she said. "We have had other celebrations too, including the 70th birthday of the Prince of Wales." In her speech, Queen Elizabeth urged people to treat others with respect, even when they have opposing views. “Some cultures believe a long life brings wisdom,” Elizabeth said in the recording. “I’d like to think so. Perhaps part of that wisdom is to recognize some of life’s baffling paradoxes, such as the way human beings have a huge propensity for good and yet a capacity for evil. She noted that the Commonwealth Games held in Australia this year emphasized goodwill and mutual respect, adding: “Even with the most deeply held differences, treating the other person with respect and as a fellow human being is always a good first step toward greater understanding." This year marks the 100th anniversary of the armistice that ended World War I, signed by the allies and Germany, and the founding of the Royal Air Force. Elizabeth, the longest-ruling monarch in British history, highlighted the timeliness of Anglican priest Eric Milner White, who introduced the service of the Festival of Nine Lessons and Carols at King's College in Cambridge just weeks after the armistice. "Listened by millions of people around the world, it starts with the choristers singing the first verse, 'Once in royal David city,' she said. "He wanted a new kind of service, which with its message of peace and goodwill spoke to the needs of the time." Queen Elizabeth expressed her gratitude to all those in the armed services. She stressed that over the holidays, "We become keenly aware of loved ones who have died, whatever the circumstances. And of course, we would not grieve if we have not loved." Concluding her speech, the monarch reminded everyone that Christ's message "can be heeded" by all, and wished all a very happy Christmas. The Queen’s grandfather, George V, began the tradition of the monarch’s Christmas message to the Commonwealth in the 1930s. Elizabeth has carried on the tradition since she started her reign as queen in 1952. Her address, which aired on both the BBC and ITV, was the most-watched program on Christmas Day with over 6.3 million viewers.